High-speed digital printers capable of printing 70 meters per minute (m/min) now are competitive with rotary screen printing in terms of speed and cost, and offer an advantage when printing shorter runs or multiple colorways. Ink-jet printing garnered excitement at ITMA 1999, but low production speed was a major limitation of the digital printers available at that time. At ITMA 2003, digital ink-jet printing machines demonstrated printing speeds of 150 square meters per hour (m2/h). However, even with increased speed, the printing technology was suitable only for short to medium production run lengths, and was well below the speed required for long runs. At ITMA 2007 and 2011, digital ink-jet printing machines had an increased presence, but it was not until ITMA 2015 that the textile industry paid serious attention to ink-jet printing for long runs. Once recognized only for sampling, ink-jet printing onto textiles is rapidly developing into a viable method of printing for smaller run specialty and customized fabrics, as well as for large run productions. By eliminating the screen preparation process, ink-jet printing allows more flexibility in the printing process, provides capability for fine line detail, near infinite number of colors, freedom from repeats and the ability to engineer a print design within a garment or furniture marker. The fine line detail and increased number of colors produce a near photographic image on the textile substrate, enabling new product categories. 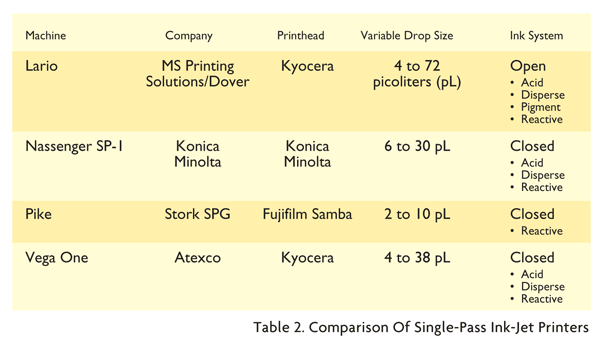 Currently, ink-jet printers can be classified into four categories based on speeds ranging from 4 meters per hour (m/h) to greater than 70 m/min (See Table 1). Much of the digital printing excitement at ITMA 2015 centered on the four single-pass printers shown: Italy-based MS Printing Solution’s Lario; Japan-based Konica Minolta’s Nassenger SP-1; The Netherlands-based SPGPrints’ (Stork) Pike; and the Vega One from China-based Atexco (Hangzhou Honghua Digital Technology Stock Co. Ltd.) (See Table 2). Digital textile printers that employ single-pass printhead systems print on the substrate as the fabric is fed under a fixed printing unit. Single-pass printers print at significantly higher speeds — up to 70 m/min — than scan-type printers that print by moving the printhead carriage back and forth. In single-pass printing, each printhead station jets one color — cyan, magenta, yellow or black (CMYK) — and up to four additional stations of colors can be added such as blue, green, violet, grey, red, or orange. The footprint of single-pass printers is considerably larger than scanning mode printers, however the speed of single-pass printers justifies the large square footage because these printers are capable of printing up to 70 m/min. MS Printing Solutions, a Dover company, was the first company to market a single-pass printer and has demonstrated leadership in this category. MS has installed 15 Lario machines worldwide, with the first installation in 2012. Italy-based Miroglio Group has three Lario machines. The printer has recorded print speeds of 72.6 m/min and is capable of printing 80,000 meters per day. The Lario printing sublimation paper can be printed at speeds in excess of 100 m/min. Konica Minolta’s Italy-based digital printing research and development center houses the Nassenger SP-1, as well as a Nassenger 8 and 10. The Nassenger SP-1, featuring 1,024 channel heads with independent-drives, delivers both high-quality and high-speed digital prints. The variance in drop size, from 6 to 30 picoliters (pL), provides high-definition prints. When needed, the SP-1 model also is capable of printing with fairly good ink penetration from the face to the back of the fabric. 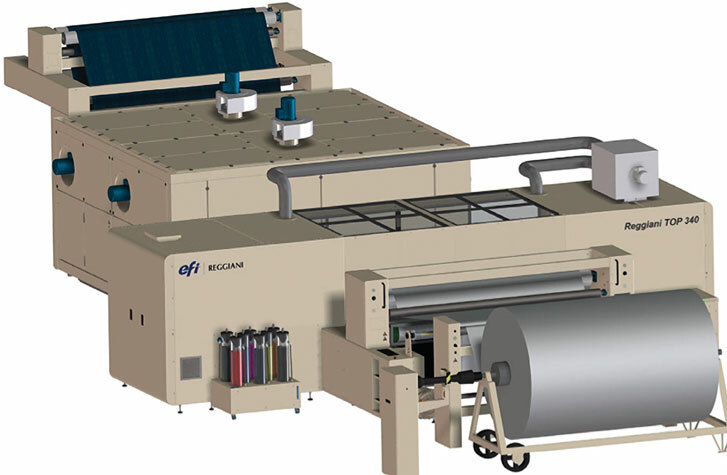 Another notable capability of this printer is an automatic printhead maintenance system that consistently checks nozzles and allows for stable, high-quality printing and continuous production. In addition, device diagnostics and remote operation are possible through a network equipped with remote maintenance functions. To further decrease printer downtime, the Nassenger is equipped with a fabric wrinkle-detection function and concave printhead nozzle surface to prevent transport problems. While increased production speeds were in the spotlight at ITMA 2015, so too was the development, or in some instances the refinement, of printers for specialized markets such as grand-format printing; sublimation printing; printing/pretreatment systems; high-density fabric printers for carpet and fleece; product printers for sweaters, jeans and leather goods; and high-quality printers servicing the luxury market. Grand-format ink-jet printers have the capability of printing widths of up to 3.2 meters with the primary market intended for printed sheeting and top-of-bed. Three companies produce grand-format printers: MS Printing Solutions; Italy-based EFI Reggiani; and Italy-based Durst Phototechnik AG. MS produces the JPK and Lario in a 3.2-meter print capacity. More than 100 JPKs have been installed worldwide over the past two years, and one 3.2-meter-wide Lario is installed in Turkey. EFI Reggiani makes The TOP printer in both 1.8-meter- and 2.8-meter- and 3.4-meter-widths. The TOP can be used with acid, disperse, reactive, sublimation and pigmented inks. The Top printer from EFI Reggiani is available in both a 1.8-meter-and 2.88-meter-wide version. The Allegro from Israel-based Kornit Digital Ltd. uses a wet-on-wet technology to jet a pretreatment and seven-color set of Kornit’s water-based NeoPigment™ inks. The seven-color set consists of cyan, magenta, yellow, black, red, green and gray. The Allegro is equipped with 64 Spectra Polaris printheads, and an adhesive conveyer belt that synchronizes with the axial unwinding system, which has adjustable fabric width and tension mechanisms. With a printing width of 70.8 inches, the Allegro is capable of printing 300 m2/h in high-speed mode. Austria-based J. Zimmer Maschinenbau GmbH’s third-generation Coloris3 has the capability to vary the drop size from 10 to 240 pL making it well suited for printing fashion fabrics as well as fleece, towels and carpets. The Coloris3 printhead is based on Santa Clara, Calif.-based Fujifilm Dimatix Inc.’s Starfire technology, a robust and reliable head because of its circulating system. When used in conjunction with Zimmer’s ChromoJET pretreatment, and the SupraPRESS inline pretreatment application unit, good color penetration of terry towels, fleece, needlepunched products and carpets may be achieved. In May 2016, Zimmer will open a 2,000-square-meter (m2) technology center in Kufstein, Austria. The technology center will provide printing, technology evaluation and training. At ITMA, Long Beach, Calif.-based Epson America Inc. showed its new dye-sublimation transfer printer system, as well as the collaborative Monna Lisa® line. Epson’s range of SureColor F-Series printers, equipped with MicroPiezo® TFP® printheads and loaded with Epson UltraChrome® DS1 inks, offer all new dye-sublimation ink technology. In collaboration with F.LLI Robustelli S.r.l. and For.Tex S.r.l. both based in Italy, Epson showed the Monna Lisa series of printers. The Monna Lisa Vinci and Monna Lisa Evo Tre feature Epson Micro TFP printheads for high-precision printing with variable drop sizes from 3 to 6 pL. The Monna Lisa series of machines can accommodate 12 ink colors and can be used with Genesta® acid, reactive, disperse, pigment or sublimation-disperse inks. This robust printer’s image resolution is unmatched in the industry, and is used by companies that value print quality over print speed. “Our company was the first in Italy to produce a digital textile printer,” reported the company. “And via continuous development with our customers, Monna Lisa technology is being used by 85 percent of the printing companies serving the high fashion brands in Italy.” Epson recently opened a Textile Solution Center in Como, Italy, for the research, assistance, training and promotion of industrial textile digital printing. The center is a joint venture between Epson ink-jet technology and For.Tex. Shima Seiki’s SJp-160 Flat-bed Printer is suitable for printing fabric too delicate or too difficult to feed through a roll-to-roll printing system. 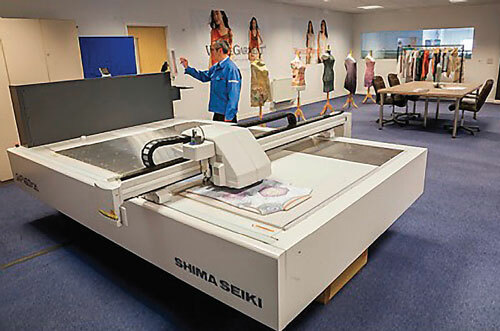 Shima Seiki also makes pre-treatment and finishing equipment for a full solution product printing system. The new Mini-lab from Portugal-based MTEX Solutions S.A. comprises a coater, steamer, washer and dryer that when coupled with a digital textile pigment, acid or reactive printer, will produce 1 m2 samples accurately in a controlled, professional environment. The entire workflow takes between 20 and 30 minutes depending on the dye type and length of time in the steamer. Editor’s Note: Dr. Lisa Parrillo Chapman is an assistant professor at Raleigh, N.C.-based North Carolina State University’s College of Textiles, Department of Textile and Apparel, Technology and Management.